Nomad PS3000 Presentation Station | OhGizmo! By Andrew Liszewski on 02/04/08 • Leave a comment! What’s the point of spending all night putting together an amazing PowerPoint presentation to distract from your ignorance on the subject matter when you end up having to show it on a crappy projector setup? It’s situations like that where you wish you had something like the Nomad PS3000 Presentation Station. It’s basically a rollable cart that includes everything you could possibly need for making those overused PowerPoint templates look their best. 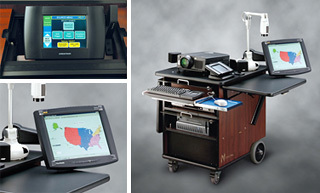 In addition to a 2700 ANSI lumens XGA projector, the PS3000 also includes a digital document camera, a VCR and DVD player, a preview monitor allowing the presenter to see what the audience is seeing, a Pentium 4 based PC and a set of Bose speakers complete with amplifier. It also has the necessary hookups if you’ve come prepared with your own laptop, and a very cool wireless touch screen remote from Crestron that can be used to control all of the components from up to 300 feet away.